I just realized that I needed to add more sides to my blog. I am always searching for new sides and I keep forgeting to add them. I guess when I am thinking of a meal, I am thinking of the main entree and not what I am having with it. I must admit that I usually just add a few cups of vegetables to go along with my meal and chow down. 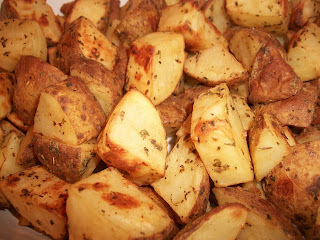 I got this recipe from http://www.weightwatchers.com/ whicle searching for potatoes as the main ingredient. These potatoes didn't take much time to prepare at all. They were a nice change from the usual baked potatoes I throw in the oven. They had a hint of dijon mustard flavor with rosemary, oregano , and parsely. I added basil and garlic powder to the mix as well. It was pleased how it turned out. I did bake it an additional 10 minutes than the stated time. Otherwise, no complaints here. Combine all ingredients, except potatoes, in a small bowl. Place potatoes in a large zip-close plastic bag. Add mustard mixture. Close bag and shake to coat. Pour contents of bag into a shallow baking pan coated with cooking spray. Bake, turning occasionally, until potatoes are tender, about 25-30 minutes. Yields about 1/2 cup potatoes per serving.